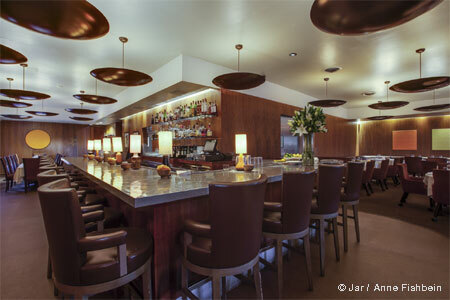 The godfather of modern Southwest cuisine riffs lyrically on the global Latin zeitgeist in his sultry downtown digs. : John Rivera Sedlar began his culinary career in his native New Mexico then came to California with a group of restaurant professionals to open and run The Silo in Manhattan Beach. Following that, he fell in love with French cuisine during a stint with Jean Bertranou at L'Ermitage in Los Angeles, and then opened his first restaurant, St. Estèphe, with a fellow Silo alum in Manhattan Beach in 1981. Here is what we wrote about it during that time period: "One must be a formidable artist to create an equal marriage without allowing one to erase each other." We were talking about his "surprising attempt at a Nouvelle Cuisine of the Southwest." We continued with: "But John Sedlar has a great deal to learn." After two more restaurants in Santa Monica, Bikini and Abiquiu, fourteen years of travel throughout the world, private catering, and the creation of a museum devoted to Latin food history, we are happy to report that Sedlar has learned a lot, maybe more than we could have even imagined. 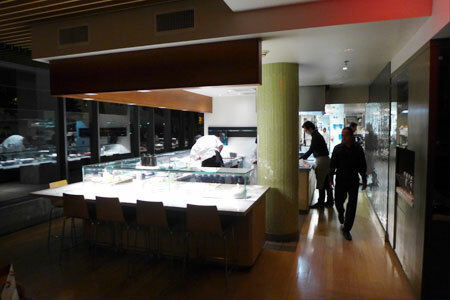 Rivera, located across from the L.A. Live complex, has a modern décor, in accordance with the chef's creativity. Enter and find on the right a glass-walled cave containing wines from the Americas and Spain; and on the left is a bar with first-class-aviation-style leather lounge chairs conceived of by designer Eddie Sotto. Just sit back, relax and prepare for the special gastronomical voyage to come. One continuous space encompasses this bar, the Playa food bar where diners can watch the chefs in action, and the main dining room, Samba, which boasts gorgeous Brazilian marble floors and a 40-foot-long video wall with ever-changing images. In the private Sangre room, "members" can sip tequila retrieved from a locked wall of bottles that Sotto likes to describe as “drinkable architecture.” (The one-time $2,500 initiation fee grants a golden access key and two bottles of Rivera’s private extra-añejo tequila, among other perks.) The menu explores the culinary diaspora of Latin cooking, re-imagined through Sedlar's own distinctive lens. Start with salmon mousse tamal with cacahuate salsa or the jamón Ibérico with house-made bread. Next, get ready to use your eyes and nose before your knife and fork. Sedlar has always excelled at presentation; here he creates graphics made of house-mixed spices, as in the Sevilla-style salad of beets, blood orange, garbanzos, Moorish spices and pistachio dust. Continue with scallops with French green lentils, celery and broccoli or filet mignon with chayote chutney and tomatoes with chocolate onion sauce. You will surely appreciate the desserts, which are as vibrant and elegant as the savory part.